Floor tiles - Hello, can I ask if the floor tiles are porcelain? If so, what size please? Love the cabinet hardware!!! - Where are the pulls and knobs from? Can you tell me what they are called? 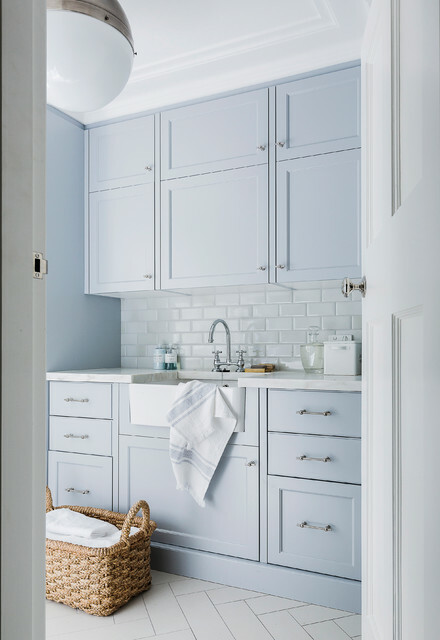 In the laundryA laundry room is the perfect place to put kitchen cabinets to use. Incorporate some base cabinets with a benchtop above to create work space and somewhere to position a laundry sink. Then add some overhead cabinets with doors to store laundry detergent and other cleaning products out of reach of little hands. Consider adding a couple of open shelves as well, to store pretty baskets of clothes pegs, cleaning brushes and other odds and ends. If space permits, incorporate tall cabinets. A pantry cupboard can be used to store brooms, mops and even a vacuum, or could make a perfect linen cupboard. If the laundry is close to the kitchen, consider using the same cabinet fronts here to create a sense of continuity. Where kitchen cabinet doors have detailing on the front or a painted finish, consider using a more cost-effective alternative in the laundry. Flat doors made from laminated board in the same, or a complementary, colour could work. 2. Location: Wahroonga, NSWWhy we love it: With oodles of natural light, soft-blue cabinetry and luxurious marble benchtops, this laundry in a renovated 1930s family home on Sydney’s north shore is pretty enough to make doing the laundry a pleasure. Well, almost. LaundryClean ceiling vents, lights, and switches. Dust behind and under your washing machine and dryer. Clean your dryer vent and inside your washing machine. “To refresh your washing machine, clean out the filters, then run a normal hot cycle. Place half a cup of bicarbonate soda and two cups of vinegar [into the detergent tray] before letting the cycle run as usual,” West says.Clean windows and blinds with warm soapy water, and wash the floor to complete the job.